I’m not a huge hotel guy, if I’ve got a basic bed and clean room I’m pretty happy but for some people, a great hotel while traveling is key to their vacation experience. 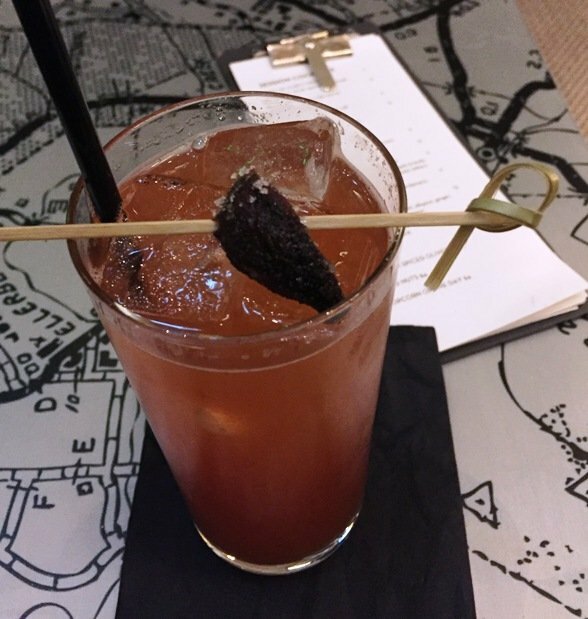 But when I got the invite from Johanna K (Durham Foodie) to check out the newish 21C Hotel and Museum in Durham, my curiosity was piqued. I had a chance to check out the Durham Hotel months ago and was impressed, so off I head to Johanna’s Friendsday on a Wednesday afternoon! 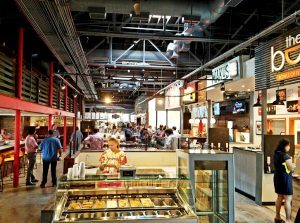 21C Museum Hotel is conveniently located right off of Durham’s Main Street and is really more of a complex. Not only does it have a hotel but it contains a high-end restaurant (Counting House), bar and lounge along with its namesake museum. The entryway is pretty humble and hides what lies inside, I’m pretty certain this building used to be a bank (you’ll soon see why). 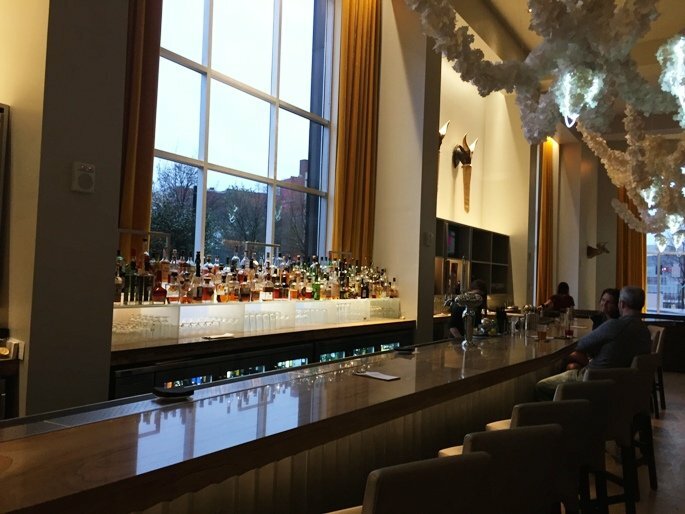 Beyond the vintage doorway, the 21C Museum Hotel expands into a very upscale and cool spot to grab dinner, a drink and enjoy the modern art on display. This hotel and the overall space is a very interesting mix of old and new, totally worth a visit! My first stop to the 21C Hotel was their lounge where a group of bloggers had gathered for a museum tour. I was late but caught up with my foodie and PR comrades, settling in with a cocktail from the bar. The bar and lounge at the Counting House is long and posh with a white, geometric art installation overhead. 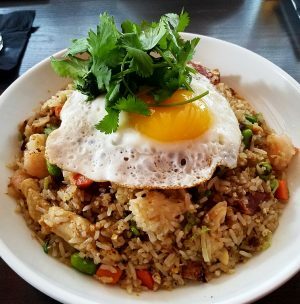 The cocktail menu offers up a good selection of interesting choices from $7 – $12 including a smaller list of lower-alcohol, session cocktails. Very reasonable prices for the chic lounge environment here. While my plan was to join the blogger group in a museum tour with a docent, I needed to stay behind and wait for a friend. After she arrived we were able to do a self-led tour afterwards and I was really impressed. First we made a stop downstairs to the Vault lounge. 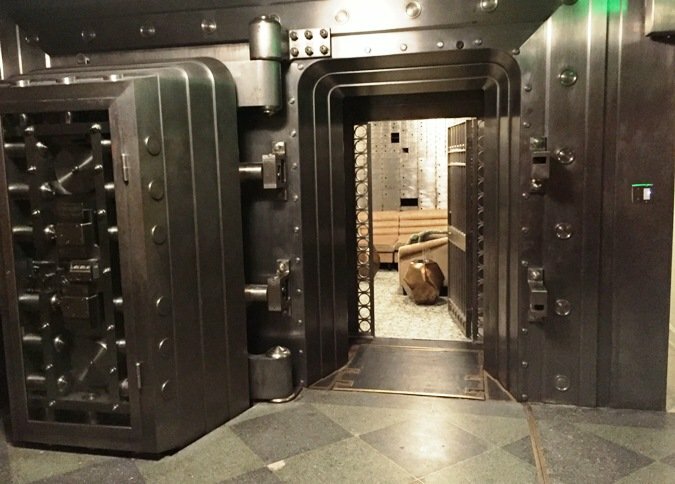 I had seen some adverts for a cocktail series here but never made it to one so I was glad to finally tour the Vault. 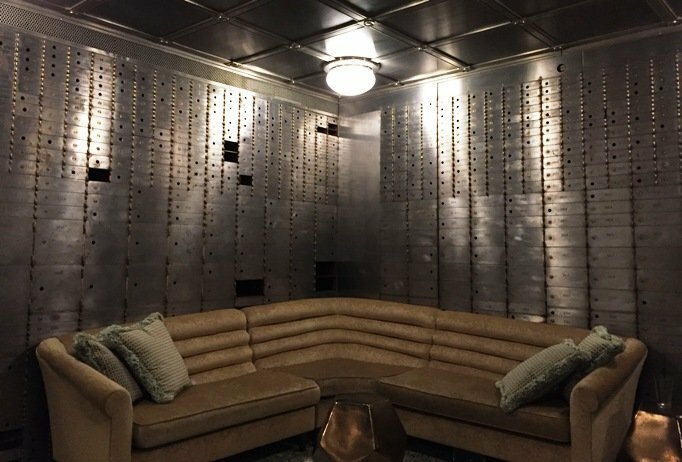 There’s a huge steel door leading to a small lounge area with couches and the back walls are lined by safe-deposit boxes, very cool! 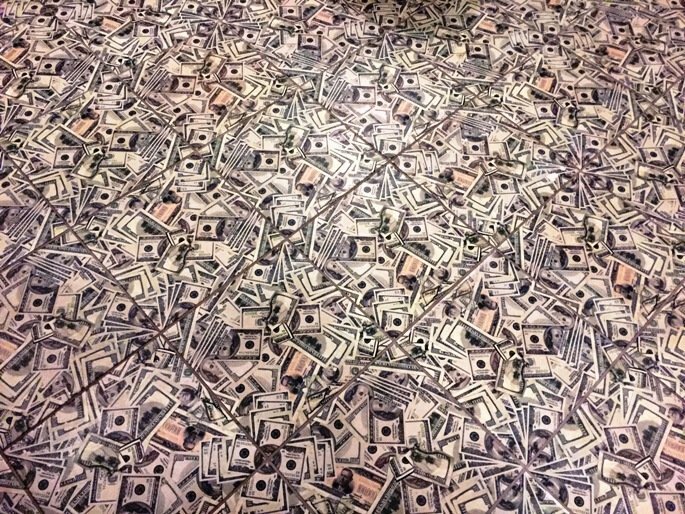 The floor tiles have dollar bill images screened onto them, a clever touch! And an odd and narrow hallway (probably for security) runs behind the vault itself and pops around on the other side of the room. Overall it’s a very interesting and anachronistic element of the 21C Museum Hotel which is totally modern, otherwise. We head off upstairs to the museum area and stop by the rest-rooms first. Another neat touch, the bathrooms at the 21C Hotel feature clear panels giving the rest-room a fish bowl appearance. Close the door and twist the lock and wham! The clear panels go opaque for full privacy. A cool and mod feature showing off a bit of technology. We move over to the art display that covers several rooms in the clean esthetics of white. And there are a LOT of cool pieces here to ponder. 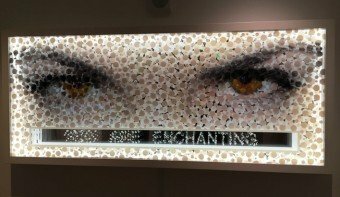 A interesting 3-d installation of a pair of piercing eyes claiming “You Are Enchanting”, it shifts depending on the viewing angle. 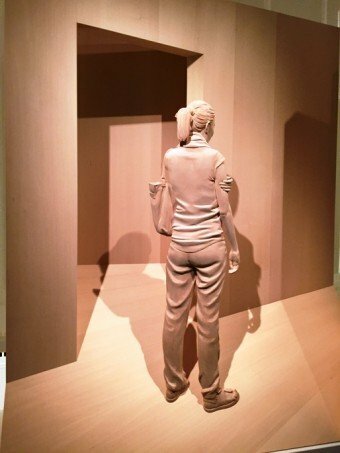 A 3-D relief of a woman in front of a doorway. 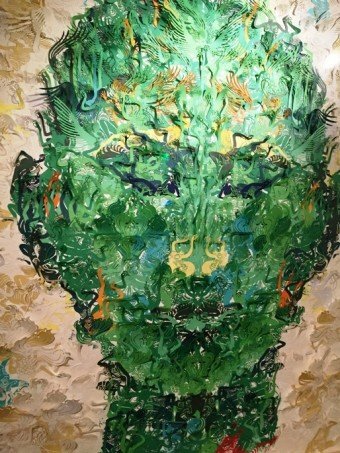 A really creative and large piece made of paper-cut pieces creating a mosaic of a face, very nice. 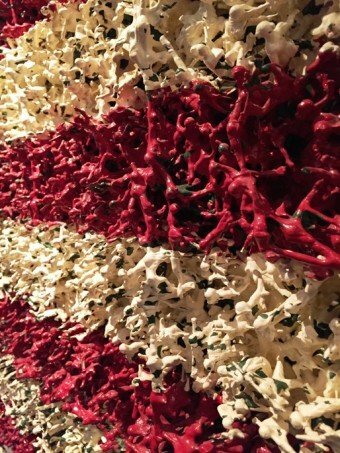 But probably my favorite piece is the American flag above that’s made of melted plastic soliders painted in the red, white and blue. 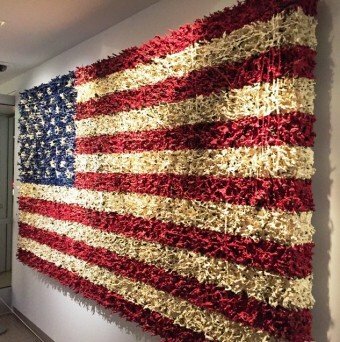 A thoughtful homage to the sacrifices made by the men and women of our country in uniform over the years. And there’s certainly more to look at the the 21C Hotel, you could probably spend an hour or two wandering around here with a cocktail in hand. As a fan of the MOMA in New York, I was pretty impressed with the overall quality of the pieces and artwork here. The only area where I think the 21C Hotel could improve is service. 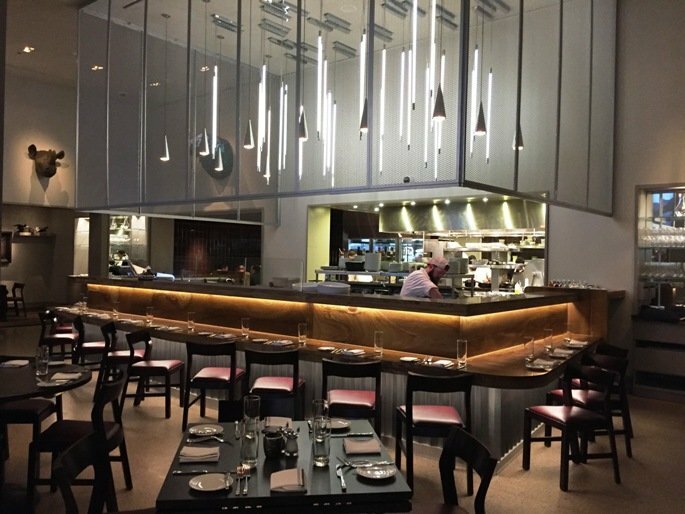 I’ve spent some time at the Umstead and Washington Duke Inn and what I noticed was that the service at 21C was a little bit off and awkward at times. But hopefully they will get that fixed over time since the place is new. So a slow clap for the 21C Hotel and Museum in Durham, very nicely done! It’s a nice spot for a cocktail, walk-through of their modern art and possibly dinner at the Counting House. I could certainly see this place being a good stop and visit before a DPAC show given some extra time. I’ve been surfing on the web more than a couple of hours at this time, but under no circumstances encountered any specific attention-grabbing blog post like yours. It really is stunning worth good enough in my opinion. In my personal opinion, if pretty much all site owners and bloggers produced superior written content items you probably did, the world wide web will probably be considerably more beneficial than everbefore.I’ll book mark this blog !! Will definitely go through once more !! Thanks for your useful info. 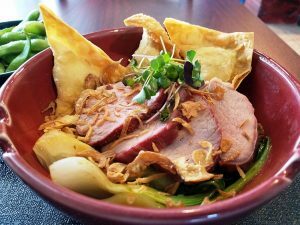 Appreciate the comment Margart and hope there’s more on my blog that’s helpful (and fun) for you to read!